Winco PMC-14U Single Burgundy Menu Cover, Single, 8-1/2" x 14"
Your customers will be able to view your menu selections when displayed in the the Winco PMC-14U Single Burgundy Menu Cover, Single, 8-1/2" x 14". This clear high visibility menu cover enables your customers to have full view of both sides of your menu by simply flipping it over. The burgundy vinyl border and attractive brass corners, gives your menu choices front and center stage. You can also change your menu options as often as needed as this menu cover holds 8-1/2" x 14" paper, allowing you to create your own menus that you can change as often as needed. 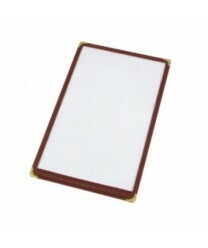 Easy to clean with a damp cloth, this vinyl menu holder is an excellent option for any foodservice operation.